As a personal injury attorney in Denver / Aurora, I would never claim to be an expert in medicine. But a natural consequence of representing people with neck and back injuries (usually from car or trucking accidents) is that I often find myself trying to calm down a client who is scared or confused about an upcoming procedure or test. Most of the time it just comes down to them not understanding what the procedure or test will involve because their health care provider maybe used some jargon or words they weren’t familiar with (us lawyers are just as guilty of this). 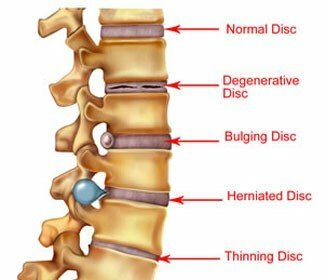 So for the masses of us who aren’t trained in the medical sciences, here’s a hopefully simple explanation of some non-surgical treatment options you might be facing for a neck or back injury, including a bulging disc (no tear or rupture in outer wall of disc) or herniated disc (a tear or rupture is present). Physical therapy almost always involves some kind of exercise, whether it’s stretching, weight lifting, low-impact aerobics, or walking. The goal of physical therapy is to improve strength, mobility, range of motion, and endurance so that daily activities become easier and less painful. Physical therapists can use massage therapy as part of their treatment, but they also have many other tools that they use, including ultrasound (sound vibrations that cause deep tissue heating and improved blood flow), electrical stimulation (helps reduce joint or muscle pain and inflammation), spinal manipulation (similar but different than what chiropractors do), and most importantly, patient education about exercises they can do at home. Massage therapists focus on longer and more full-body massages with the goal of muscle relaxation and stress reduction. The idea is that a body in constant stress takes longer to heal, so relaxing the body allows it to heal and gives other treatments a chance to work more effectively. Obviously everyone is different, but I typically see the best results in clients who put in the work necessary (diligent about their home exercises and attending their appointments on a regular and consistent basis). However, physical and/or massage therapy does require a large time commitment and some people understandably find it difficult due to their jobs or other commitments. If that’s the case, talk to your health care provider about other possible options. Chiropractic adjustments involve manually tweaking the vertebrae to relieve joint pressure and even gasses trapped in the joint (joint cavitation). Qualified chiropractors can also use other techniques, like electrical muscle stimulation and therapeutic massage and exercise, to help loosen knots or muscle spasms. Although there is some overlap between chiropractors and physical therapists, most chiropractors believe that spinal adjustments can be used to treat any system of the body (not just spinal dysfunction), including stomach troubles, ulcers, menstrual cramps, thyroid conditions, kidney disease, constipation, heart disease, lung and other diseases. The belief is that spinal adjustments can alter neurological function and since nerve fibers go into every area of our bodies, including our organs, improving that nerve function allows certain organ and immune processes to work better. What a lot of my clients have told me is that chiropractic treatments work as long as you are getting them, but once you stop, so do the benefits. However, a good chiropractor, like a good physical therapist, can offer some valuable nutritional and exercise guidance, as well as lifestyle recommendations, which may improve your situation long after you stop seeing the chiropractor. Trigger points are knots in your muscle, or focal points where the muscle consistently spasms. With a trigger point injection, a physician inserts a needle usually containing a mixture of anesthetic (to reduce pain) and corticosteroid (to reduce inflammation) into the trigger point. In some cases, for example because of an allergy to certain drugs used in the injection, a needle will be inserted into the muscle trigger point without any medication. This is called ‘dry-needling’ and can be just as effective in relieving the trigger point. Sometimes injections are used not only to reduce muscle pain, but also reduce nerve pain caused by bulging discs (no tear or rupture in outer wall of disc) or herniated discs (a tear or rupture is present) in your neck or back. These injections can also be helpful in locating the exact source of the pain (which can’t be done with MRI or other scans). Facet joints are the joints in the back of your spine that allow each of your vertebrae to link up and flex together. Using x-ray guidance (fluoroscopy), a needle is carefully injected into the facet joint with a mixture of anesthetic and steroid medication to help relieve the inflamed nerve root that shoots off the spinal cord. Because the needle goes deeper than a trigger point injection, there is usually more initial discomfort involved with this type of procedure. However, the relief from a facet injection typically lasts longer than the relief from a trigger point injection. 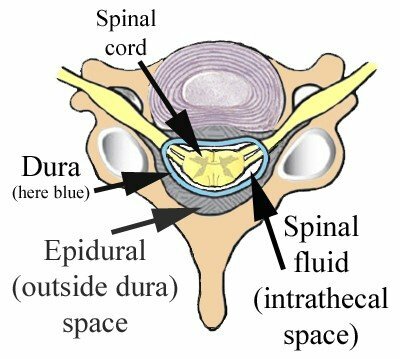 Similar to facet and medial branch injections, epidural injections place the medication in the epidural space between the spine and spinal cord. 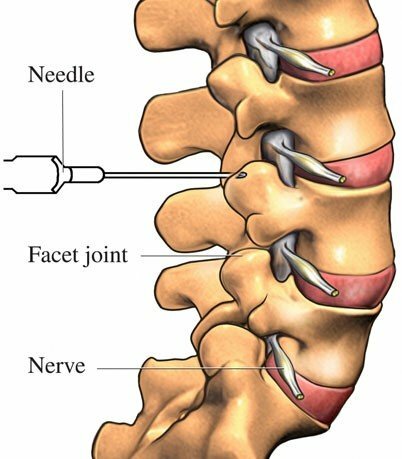 While a facet joint injection places the medication inside the facet joint, a medial branch block is an injection that places the medication to the nerve roots (called the medial branch nerves) that supply the facet joints, just outside the facet joint space. All of these injections can be performed in your doctor’s office (outpatient) and with just local anesthetic. Because these injections involve injecting steroids into your body, your doctor will typically recommend that you limit the number of injections to 2 or 3 times per year, or vary the types of injections. After your health care professionals have pinpointed the nerve root or roots that are the source of your pain, the next step might be a rhizotomy. A rhizotomy is performed outpatient (in your doctor’s office, like the other injections discussed) usually by an orthopedic spine surgeon and it generally takes less than an hour. 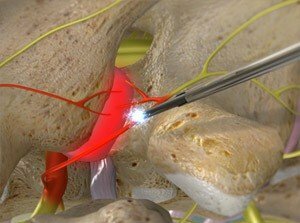 During a rhizotomy (also referred to as neurotomy), your physician will make a small incision in your neck or back and then insert a long needle-like tube that uses an electrical current (radiofrequency waves) to essentially burn or destroy the nerve fibers in the spinal cord that carry pain signals to the brain. This is usually the last step before considering actual spinal surgery. My personal injury clients typically find the best relief with a combination of these treatments. Generally, health care providers like to start slow and conservative (physical therapy, chiropractic, acupuncture) before getting more invasive with stuff like injections. But sometimes physical and massage therapy can only do so much before an injection directly targeting the inflamed nerve root becomes necessary. Injections and rhizotomies are quick, easy, and potentially provide relief that lasts for months or more. For example, because a rhizotomy destroys the problem nerve root, the pain relief can last the longest, between 5-8 months, and sometimes is even permanent. The nerve root can grow back, but the hope is that it grows back normal instead of damaged like it was before the procedure. However, injecting steroids or any pointy thing close to your spinal cord always carries a certain risk, and you should understand these risks before any procedure. That’s why the lifestyle recommendations, such as at-home exercises and nutritional advice, that a good therapist or chiropractor can provide cannot be undervalued. Incorporating these into your daily or weekly routine empowers you with the control and management of your own symptoms without the need for constant medical intervention. Have more questions about your injuries after a car wreck? Call Colorado's Gama Law Firm and speak with Richard Gama at no charge.